Our family sadly announces the passing of our Lil Momma, wife and grandma, Deanna Mary McAllister, nee Bourgeois, on Dec. 8th /2017 at the age of 75. 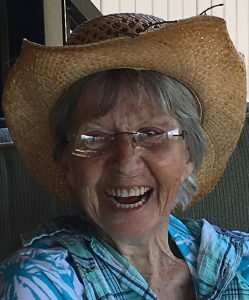 She will be lovingly remembered and missed by her husband of 55 years, Bruce, daughter Lana Nielsen of Squamish (Dave) and granddaughters Raelene and Destiny Leveridge, her brother Wayne Bourgeois (Shirley) and Gary as well as other extended family and friends. She is predeceased by her son D’Arcy, brother Russell, along with her parents Steinke (nee Blessum) and Wesenberg’s. Deanna was born in Barrhead, AB on 9/18/1942 and resided in Barriere, BC the last 9 years with her husband. She met Bruce in Mystery Lake, AB and they spent their first 15 years together in Swan Hills, before moving to BC. They previously resided in Lac La Hache and Parksville after spending many years in William’s Lake where they started their business De-Bru Sales Ltd.
Deanna (Lil Momma and G-Ma) will fondly be remembered for her beautiful smile, kind heart and gentle soul. She was a woman of strength, character and resilience. For those who knew her, when your days are dark, think of her brilliant million dollar smile. A memorial service will be held in the spring when the flowers and new life blossoms. Donations may be made to the ALS Society, Hospice in your area or a charity of one’s choice in her honor. My heartfelt condolences to you Bruce and your family, and may cherished memories bring you all moments of comfort and ultimate peace to your heart’s.